Literally soaring high above the ground, Dr. Salvador Araneta with his wife Dr.¬ Victoria Lopez de Araneta founded the Far Eastern Air Transport Incorporated (FEATI), the first airline in the Philippines flying the Iloilo-Manila-Hongkong route. The couple's shared vision to take people to life-changing destinations paved way for a more critical approach in aeronautics, technology, the arts and sciences. Giving up the airline but retaining its name, the couple founded FEATI Institute of Technology on March 6, 1946- a school particularly focused on engineering and technology. Thirteen years later, the school earned university status as granted by the Department of Education with Dr. Victoria Lopez de Araneta as the first president of FEATI University. With its vast five-hectare campus, FEATI University is considered as one of the pillars in the field of education and the right venue to prepare young individuals to be globally competitive career men and women. Through years of educational experience, the University has successfully produced outstanding alumni both here and abroad. Numerous FEATInians have served in the government, military, diplomatic corps and private sector in the field of engineering, science, technology, and commerce. 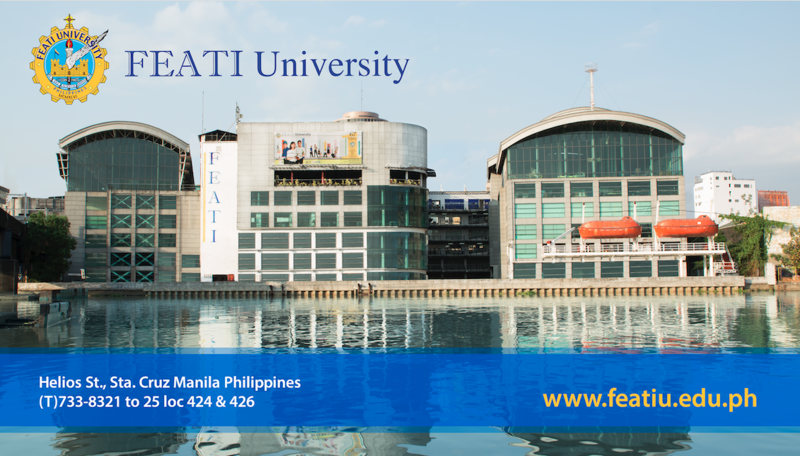 Today, FEATI University is a non-sectarian co-educational institution with a Catholic orientation. It offers undergraduate and graduate programs that prepare its students to reach their desired career destinations with a love of learning and excellence.